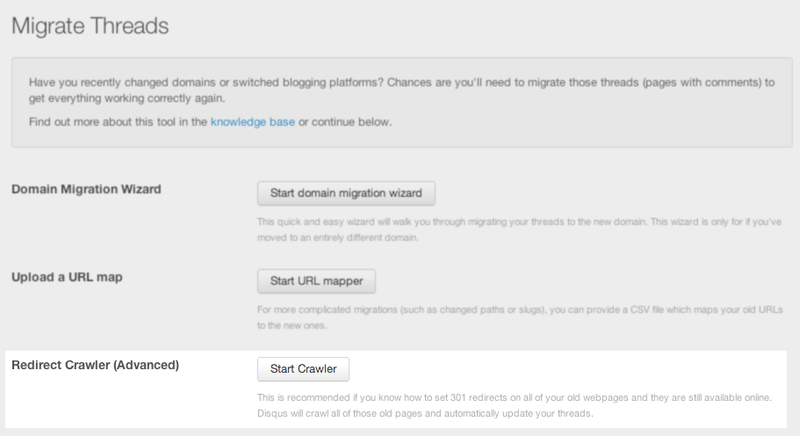 This migration tool will follow 301 redirects and migrate comments automatically. Each old permalink must redirect to the proper new permalink rather than the root domain. After these 301 redirects are functioning properly, you can start our 301 redirect crawler by clicking the Start Crawler button on the Tools > Migrate Threads page. Note: Migrations can take up to 24 hours to finish, and we suggest checking its progress occasionally during that time (by looking for the updated comment threads on a page where they did not previously exist). If you've run the Domain Migration Wizard or Redirect Crawler and your threads have not migrated after 24 hours, it is possible that the threads are not set up to properly migrate with that tool. Try using the URL Mapper to input the exact thread URLs that must be changed. You can run the URL Mapper concurrently with the Domain Migration Wizard or Redirect Crawler, as they will not conflict with one another.